Welcome to Number Seeker, a game where students can hunt for numbers while practicing their more and less skills on a number chart. 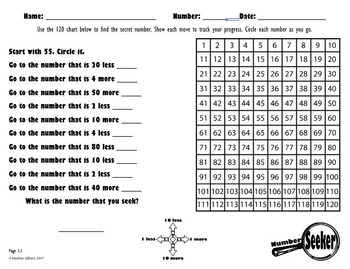 Aligns with the common core in the number and operations in base 10 thread. These sheets are leveled to start with changes that are only in the tens place or the ones place, then moves to changes in both tens and ones within the same lines, and moving to changes in tens and ones requiring line changes. The bottom left corner of each page has a level and page number for discrete differentiation. This pack only includes level 1, with 4 different quests, on 4 separate pages.